The Zion Train has an intriguing history. Built in Netherlands in 1962. The 164-foot long Zion was initially used to move cargo throughout Europe. In July, 1997, while in port on the Miami River with a crew of nine Haitian citizens, five of the ship’s crew members were shot and killed by “pirates.” Three months later, the ship ran aground off South Beach, Florida. 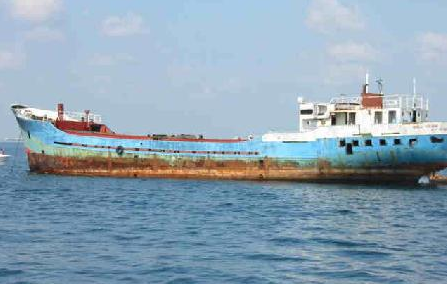 Federal marshals later seized the ship for nonpayment of dockage fees and sold it to Schurger Diving & Salvage, Inc. The ship was eventually scuttled in June 2nd, 2003. Now, the Zion, a small freighter listing to its port side with its bow broken off by a hurricane, faces south in 90 feet of water approximately one mile north of the Jupiter Inlet, together with two other wrecks. Collectively, the three wrecks are called the Zion Train, with the other two being Miss Jenny, an upside down barge, and Esso Bonaire, a large, upright barge. These wrecks are home to some many a sea creature, some of them very large. When divers approach the Zion, resident goliath groupers slowly try to find an out-of-the-way corner in which to hide. The wreck, being wide open, allows divers to get a good up-close look at the goliaths even as they try to hide. In late summer, when goliath groupers aggregate; there may be as many as six or seven of these giant fish on the Zion alone. East end of the Zion lay a pile of concrete beams, which in January and February, become a useful spectator area for lemon shark viewing as a couple of dozen of these large, impressive sharks circle out into the sand. They make the reef sharks appear very small. Drifting north from the Zion, divers come across the Miss Jenny, also home to goliath groupers as well as gag groupers and black groupers. On a 340 degree course from the Miss Jenny, a course clearly marked by rebar stuck in the ground every thirty feet or so, is the Esso Bonaire, the largest of the three wrecks. Its cabin area at the stem is safely penetrated, but it is suggested that divers do not go into the lower areas.